This easy and peanut buttery cake is perfect for feeding a crowd. 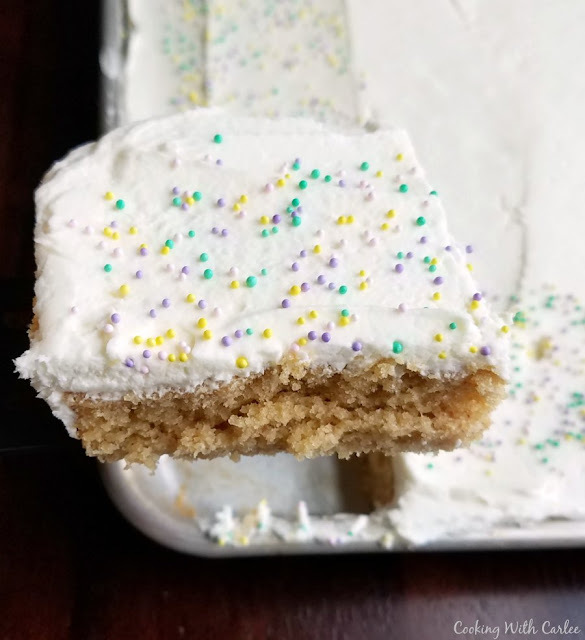 It is made much like a Texas sheet cake and would be good with that chocolate icing, but we love it with white chocolate buttercream for an extra special treat! This fun sheet cake is full of peanut butter flavor. 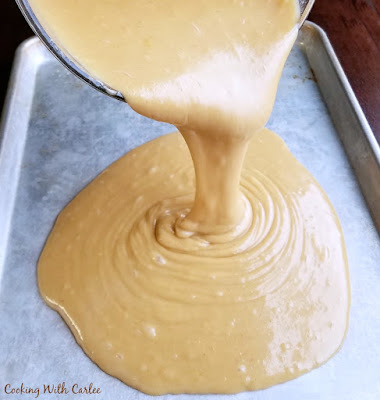 It is made in the Texas sheet cake style where you boil the butter and water on the stove, so there is no need for creaming or fussing to get it together. Plus it is a great size for sharing, but don't worry, it will disappear quickly. 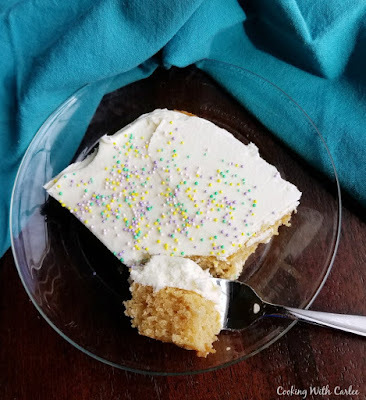 I made it as one of the treats at Little Dude's second birthday and thought it was time to remake the recipe, shoot some quick pictures and update the post a bit. For one of Little Dude's birthday cakes, I thought it would be fun to do a sheet cake with one of his favorite flavors... peanut butter! I loved the idea of making a sheet cake. The fact that the cake isn't as thick as a traditional cake makes it so people could just have a little bit if they wanted or as much as they please. Plus I could pile it high with white chocolate buttercream! A few sprinkles around the side and a birthday cake is born. One of our favorite parts about baking sheet cakes is they don't take any special equipment. Just a sauce pan, a couple of bowl and the sheet cake pan. No need for the mixer, which is good because I only wanted to wash it so many times for this one party! Plus there is the added bonus that you don't have to bring your ingredients to room temperature. This cake has been a hit every time I have made it. This most recent time one of my brothers took a bite and said it tasted like Reese's cereal. It kind of does! But in a much softer cakier kind of way! So if you are half the peanut butter fans we are, you should definitely give this cake a go. The size makes it perfect for a potluck, BBQ or party and the fact that in can go from idea to coming out of the oven in less than 45 minutes is nice too. There's no waiting for the butter to soften to be able to cream it! Some of our other favorite peanut butter treats are Emily's no-bake peanut butter bars. We had some again last weekend and they were a hit with my husband yet again! We also loved the peanut butter chocolate chip no churn ice cream. For a healthier treat, we love the peanut butter and yogurt fruit dip and it really doesn't get much easier than that to make either! What are your favorite peanut butter treats? In a large bowl, mix together flour, sugar, salt and baking soda. In a saucepan, melt butter over low heat. Stir in peanut butter until smooth and melted. Mix in hot water, bring to a bubble and remove from heat. Mix the eggs and vanilla into the milk mixture. Add hot peanut butter mixture to flour mixture and stir until just barely mixed. Stir in milk mixture and continue to stir until just incorporated. Spread into a greased 13x18x1" half sheet pan and bake at 350 F for 25 minutes. Wow, that looks so good! I don't know why, but a peanut butter sheet cake is one of those things I never thought about doing. Sheet cakes are always white, chocolate, or marbled in my world. I can't wait to try this new take! I hope you love it as much as we do! We are kind of addicted to peanut butter around here though! Thank you! It really was quite delicious. It was an exhausting but fun weekend here, I hope you had a great one as well. See you Friday! Yummy !! I love Peanut Butter!! Thanks for Sharing on My 2 Favorite Things on Thursday - Link Party!! Hope to see you again tomorrow!! Pinned!! Me too! This combo of peanut butter and white chocolate was so good! Thanks for hosting, see you tomorrow! I can't wait to try your Peanut Butter Sheet Cake, I just pinned it! Thanks so much for sharing your post with Full Plate Thursday. Hope you are having a great day and come back soon! I hope you love it! I can't wait to see what you filled your plate with tomorrow. Thank you! It was a really good combination, I think it might be making regular appearances around here! 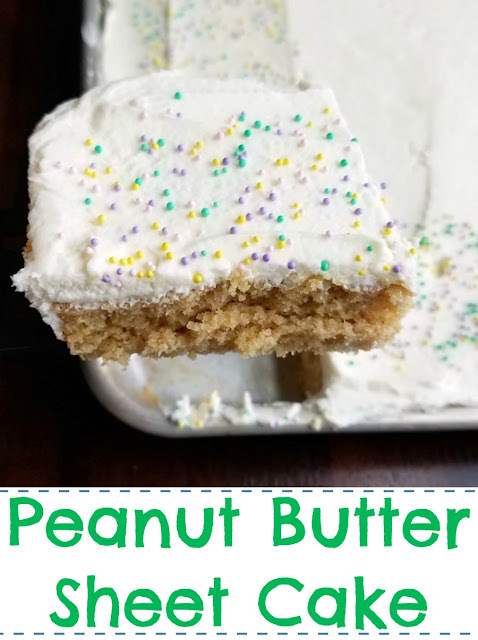 Peanut butter is one of my favorite flavors too, this cake sounds wonderful! Thanks for sharing at What'd You Do This Weekend?! I think I might have a slight addiction to peanut butter. I didn't keep it in the house pre-Jax because I couldn't trust myself with it! Now I am slowly getting used to having it around. What size pan? It just states greased sheet pan---thanks! What size pan? It just states greased sheet pan---jelly roll pan, 9x13? Thanks! 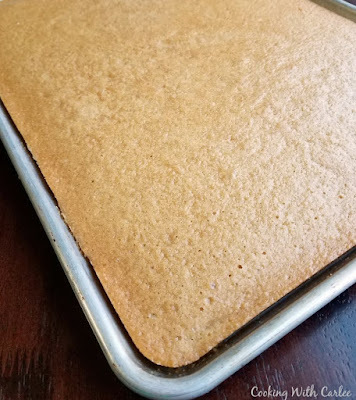 Sounds like the Peanut Butter Texas sheet cake, but you only state a greased sheet pan, what size pan do you use? Thanks! It's just like a Texas sheet cake! Sorry I wasn't very clear. I used my half sheet pan which measures about 12 x 18 x 1. We really enjoyed the combination of the peanut butter cake and white chocolate frosting! It is gong to be hard to not make it for every birthday from here on out!! Thanks for hosting, I'll see you tonight! It really was so good! The white chocolate frosting and peanut butter cake were really delicious together! Thank you so much for hosting! See you tonight! Yum! I've never tried a peanut butter cake - but I'll be pinning this for later! Thank you so much for sharing at Talented Tuesdays! We really enjoyed it! You should really try the white chocolate frosting with it. Yum! Thanks for stopping by! Peanut butter is one of my favorite flavors too, this cake sounds wonderful! You know this will be a hit in my house with all my PB lovers! It really looks Springy with the sprinkles, I’m thinking a great dessert for an Easter crowd! That would be perfect! Thanks, Andrea! I have NEVER made a peanut butter cake and I wonder why?!? I will have to remedy that! Pinned and share on facecbook! I love sheet cakes, and this looks delicious! In my opinion, one can never have too many peanut butter recipes. This sheet cake looks fantastic. I agree completely! Thank you! This sounds so good! You can't go wrong with adding peanut butter to a birthday! I agree, the more peanut butter the better!